It’s been too long since I had a post that is just about showing off a finished crochet project, and guess what… I have one to show you! 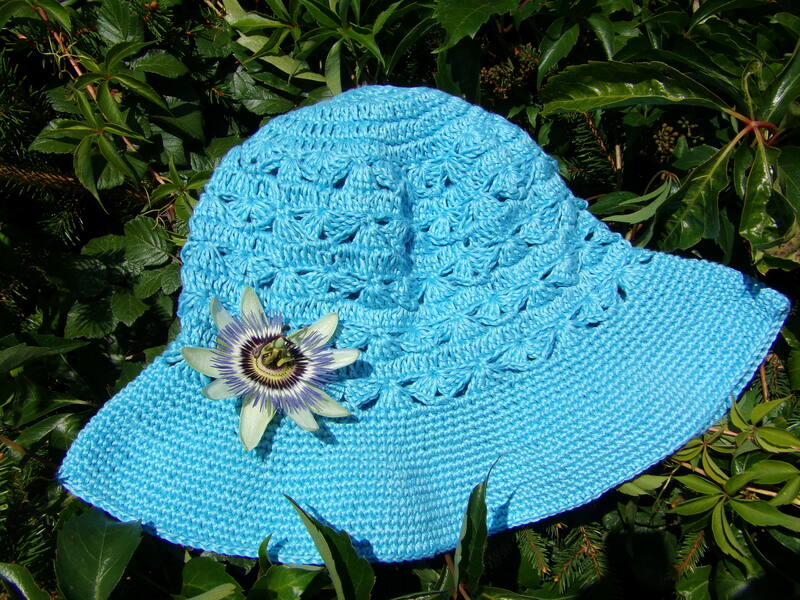 This is my lovely linen crochet sunhat! 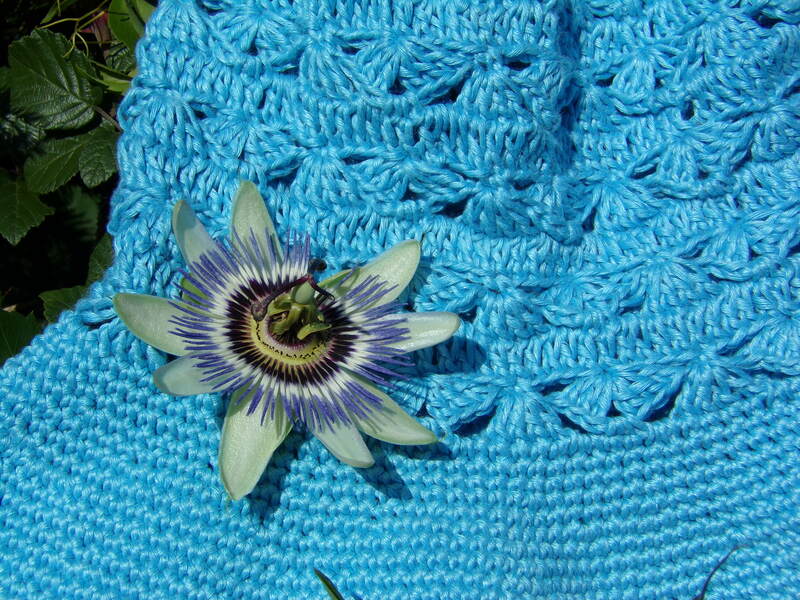 As modelled by the old Christmas tree in my neighbour’s garden that has been taken over by a particularly luscious passion flower plant. I was a bit naughty and picked one of the flowers for the picture. Shh! Don’t tell anyone! It was missing a petal anyway! How is already a week since I went to Fibre East with my mum and lil sis Katie? Cute little hand sewn pouch purses, quick dash to Germany, and (very) minor brush with fame! 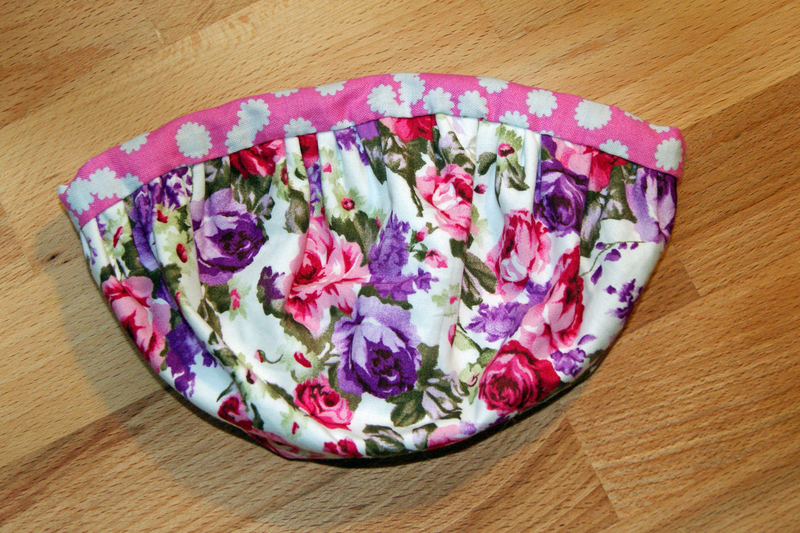 I’ve well and truly fallen in love with sewing again. It’s not that I ever really fell out of love with it, but lack of practice had undermined my confidence leaving me too nervous to even try. Fortunately learning how to follow a pattern to make pyjama bottoms, together with the kits I made last week, gave me the confidence to get cracking on some of the projects that have been a very long time in the planning stage! But it was a pattern for a little pouch purse sewn almost all by hand that really captured my attention and pushed its way to the head on the queue. Granny hexagons, squares and Fibre East. My intention to blog at least every few days has fallen by the wayside during what has been an otherwise very productive week. I’ve made almost all of the granny hexagons I’ll need to make up the birthday present for one of my three nieces. It’s going to be a waistcoat (a gilet or vest to those over the pond) worked in DK acrylic (mostly in Stylecraft plus whatever was hanging about in my stash). I’ve gone for cool greens and blues with a little splash of purple, which I tend to think of as a mermaid/peacock colour scheme. I hope my niece likes it. At seven going on eight she already has a keen eye for fashion and doesn’t hold back when giving her opinion. I’ve been wearing a lot of light cotton sundresses in the recent heat wave, and twice the little madam has looked at me and said “You’re not going out dressed like that, are you?” I’ve come to the conclusion that it is the sight of my knees that she finds so scandalous. Apparently women over thirty aren’t supposed to have them.